-- Straight from Yard - I absolutely love the sound. Share some about the development of that song on Josh Heinrichs' newest Rooftop Session EP and the musicians involved. When Josh and I were bouncing around a couple ideas for songs, like many times before, Heinrichs had a great ganjah hook. I wrote some new herb lyrics, and at the last minute we decided to record two brand new herb songs. One being "Straight from Yard," and the other is "Ganjah Inna Missouri." We had the whole Springfield crew in Branson, Missouri at Greg Roller’s: Mick Kline on bass, Lance Sitton playing guitar, and Ian Foreman on drums. We worked on the songs as much as possible a week prior to recording, and the results were great. I'm honored to be on the track - it's a great EP. --Your cadence and lyrical delivery harmonizes with Josh Heinrichs' soul or Lance Sitton's sweet acoustic sound so beautifully. Given the strong degree that you collaborate on recordings, how do you all approach songwriting together? 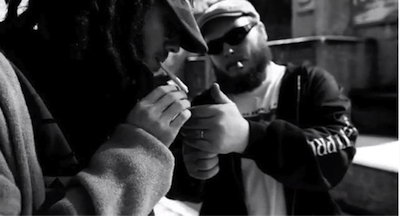 GanJah Records is comprised of solo artists, but I think we all understand how to share. We know when to lead and when to play a supporting role. I have known Heinrichs for over a decade; we went to high school together and played in Jah Roots together and have always had good musical chemistry. We both then had solo goals we were working on, and, eventually, after about a 5-year-long stint we started collaborating together again. I grew up musically in that time, and he encouraged me to use my raw dancehall vibes in a more positive, roots style. I'm proud to say that GanJah Records is made up of multi- talented artists such as Lance Sitton, and our KC Homies, 77 Jefferson. I'd also like to mention our good friend Cas Haley and Df dub All-Stars out of Texas who frequently add their talents on tour as well. --How do you understand your transformation from an artist who started in dancehall in Jamaica many years ago to your sound now with GanJah Records? I love reggae, both roots and dancehall. My first reggae injection was roots. I was listening to Peter Tosh at about age 9. Then, around junior high I grew interested in dancehall music. I took on the name BaddaFlexx when I first came out as an artist. 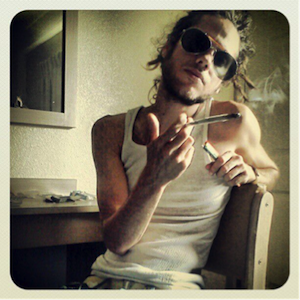 My goal was to be the baddest trash-talking white reggae artist since Dominic from the UK. At the time, a dancehall reggae scene didn't exist in Missouri, which resulted in me leaving Missouri for New York at age 19. It broadened my horizons, and I learned that the Jamaican Community is huge all over the tri-state area. All of a sudden, my life was immersed with Jamaican culture and music. There was many ups and down during the early days. I was fortunate enough to perform on some of the biggest stage shows in New York, Miami, and Jamaica, such as Fully Loaded, Sting, and Sumfest. On the downside, I got "bottled" at Nagasaki night club in Long Island one night. That was a definite wake-up and one of my worst moments. I was fortunate enough to make many lengthy trips to Jamaica, which sharpened my skills a lot. Jamaica is no joke when it comes to reggae.I was not as talented as the Jamaican deejays and singers I was around. Still, I got better at my craft and would eventually do pretty well for an American dancehall artist. But really I was just a small blip on the scene in general, even smaller on the international reggae scene as a whole. I didn't feel like I was making much impact through strictly dancehall. I wanted to inspire. I officially changed my name from Baddaflexx to Skillinjah. Gradually, my music got more reality-based. The switch to a more roots pace helped broaden my horizons. Josh helped me a lot during this transition. Some of my early work is cool but full of slackness, and it lacks quality. I want to keep making good quality, long-lasting music. I'm working towards that. --When we initially spoke about this interview, you said reggae is rising all over the country. I couldn't agree more. Why now is there such a global calling for reggae? In your mind, what is the question that this musical style is soothing and who is doing the asking? Reggae is real. It soothes the brain. It’s a proven fact. If you know suffering on any level, you can relate to reggae. The core of reggae is a heartbeat. All over the world people are drawn to the sound. Everyone out there is making their own kind of reggae. The awesome thing is that one genre has the power to do this. Hawaii is full of talent - America, Germany, The UK, South America, the list goes on and on. It has not always been like this. I have seen this music break through many borders. --How do you understand reggae in the US Midwest? What's unique to the sound and what do you hope people come to understand about the music generated by you and others out of GanJah Records? We are putting a Midwest twist on roots with some dancehall style. The singer/deejay combination is a classic style, for example Chacka Demus and Pliers or Steven and Jr. Gong. If you put Barrington Levy alongside Bounty Killer, it's gonna be sick. The contrast between voices is something people love. It's great having two very experienced singers like Josh and Lance to mix with my dj style. I’ve been emulating my favorite Jamaican singers and deejays since I was a kid - fast delivery, slang, chanting, using metaphors, rhyming ... Josh and Lance both have their own unique styles, too. They sound totally different even though they are both singers. The important thing is just doing what feels natural. I think our environment, the weather, the country vibes, Midwest living - all that stuff gives us our unique sound. Basically, we are all a little country. The Midwest twang, you can hear it in our voices. --Whose on your playlist now? Top ten this week, no particular order. This is what I’m bumpin’ in the Volvo - skilla beng bong! --I was thrilled to hear you will be returning to CaliRoots this year. What can fans expect? It’s gonna be an assortment of some of our bigger tunes we have between, Josh, me, and 77Jefferson. We will be representing for GanJah Records, sharing the main stage together. We are all very excited to be a part of this great line-up. Cali Roots has always treated us very nicely. Big up the whole west coast massive! --You all have posted video of many a rooftop session - can you share your favorite in memory? Singing a Rooftop Version of Ganjah Farmer with the legendary Marlon Asher. --From the Jamaican dancehall circuit to Jah Roots to 45 Shoot Out to Emergency Spliff, Reality, and most recently Skillmatic, you've covered a lot of musical ground. What's next for Skillinjah? I’m gonna keep making reggae music. Can’t stop - its an affliction! Reggaemylitus for real. You can expect touring, shows, and a new GanJah Records Skillinjah EP coming soon in the next couple months - more songs with Josh, Lance, and 77 Jefferson. I’m working with Brooklyn-based Sound Systems, Persian Cat, and BBC HiFI on a soundclash style mix cd featuring Skillinjah dubplates and combos with many fellow east coast reggae artists. I hope to get more merchandise and music available to my fans. 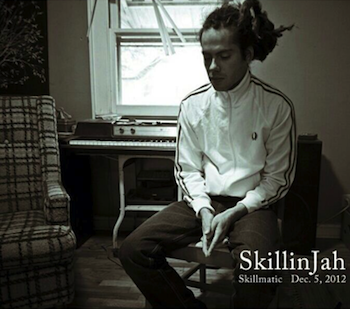 Digital albums of Skillmatic, Reality, and Emergency Spliff are all currently available at all digital retailers. Big up GanJah Records! Big up Music Bailout, Big up all my fellow artists, reggae promoters, and fans. Much love..... Thank you for the interview.